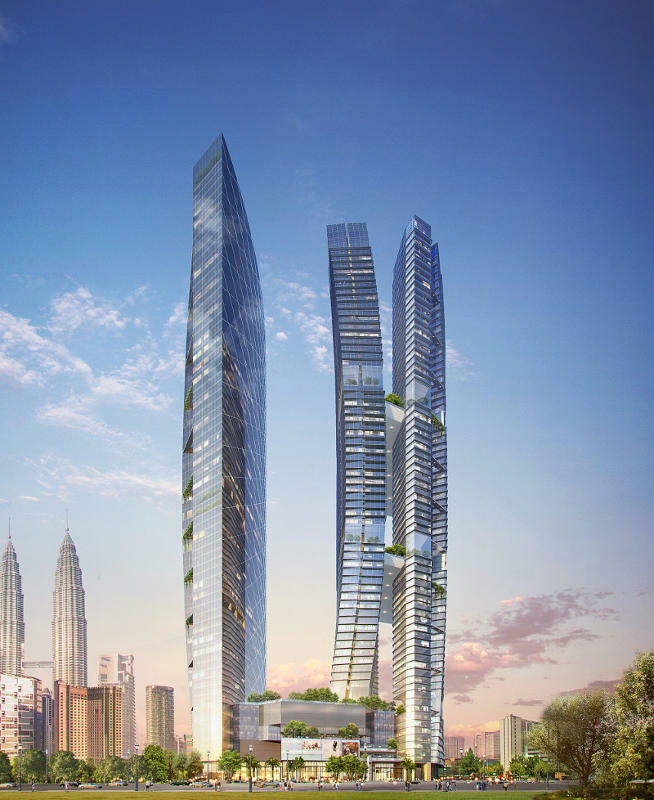 If you happen to pass by the ongoing development of 8 Conlay, right in the middle of Kuala Lumpur’s bustling golden triangle, it’s quite unlikely you’ll sense the scale and ambition behind those hoardings. The maiden project of KSK Land, 8 Conlay is about as spectacular an announcement you can make as a debut development – the world’s tallest spiralled twin residential towers complemented by a hotel and serviced hotel suites operated by one of the most venerable names in luxurious hospitality. Sitting on a nearly 4ac site in one of Kuala Lumpur’s most prestigious addresses, the mixed-use 8 Conlay has an estimated gross development value of MYR5.4 billion and is expected to be completed in 2020, The 68-storey five-star hotel and serviced suites tower will be managed by Kempinski Hotels, Europe’s oldest luxury hospitality group, which will also provide services for the branded residences for the two gleaming residential towers, YOO8 serviced by Kempinski. The two towers will comprise 1,062 apartments that range from one to three bedroom units. The 62-floor Tower A will feature 564 units, ranging from 700 to 1,308 sq ft in size, while the 57-floor Tower B of YOO8 will feature 498 units that range from 705 to 1,328 sq ft in size. Two sky bridges will link the two towers at levels 26 and 44, while a nine-storey central podium, consisting of four stories of curated retail space, a banquet hall, as well as five levels each basement and elevated car parks, will complete the development. Joanne Kua, CEO of KSK Group and Managing Director of KSK Land, has a clear vision for the branded residences of YOO8 serviced by Kempinski. “We have a very clear definition of branded residences,” she said at the London office of interior designer YOO. There are three main pillars that underpin the project, beginning with luxury services provided by Kempinski Hotels, which is making its first foray into Malaysia. “Kempinski was an obvious choice for us – we’ve been to their hotels and the one thing that never wavered was the luxury service,” Kua explained. Apart from facilities like Kempinski The Spa, gym, swimming pool and a variety of restaurants and bars inside the hotel that complement the offerings of the central podium, residents can also look forward standard and a-lacarte services by Kempinski. 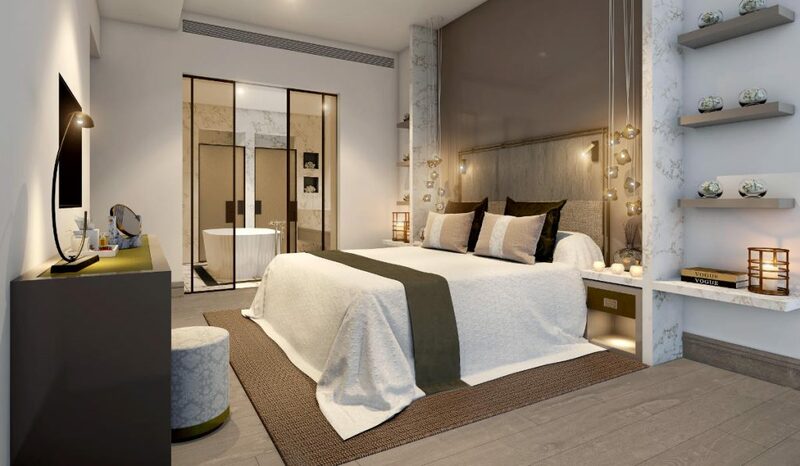 This will include concierge, butler and maid services, 24-hour room service and private chefs, housekeeping and laundry, limousine services as well as residence maintenance packages – all of the standard that a Kempinski Hotel guest would expect. Just as important, Kua said, is 8 Conlay’s architecture. “We wanted liveable architecture, which frames the development and defines how it’s supposed to be like from the onset,” she explained. “As it sits on a four-acre piece of land, we strived for the balance of living in the city as well as the space surrounding the development.” The architecture’s arresting design by award-winning Hud Bakar, Principal of RSP Architects, takes a visual cue from the Chinese philosophy of yin and yang, where opposing force serve to complement each other, which is most clearly reflected in the spiralling residential towers that wrap around each other. The final pillar is the design of the residences. “Design is more than just how it feels like visually or how things actually look – that’s just being a decorator,” Kua said. 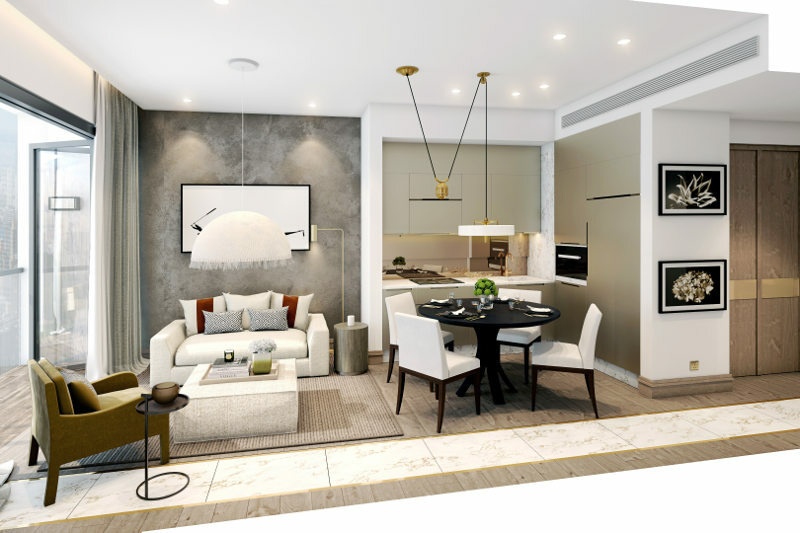 “A designer designs spaces – and this is extremely important where branded residences are concerned. You need to think of everything for the individual, from when they walk into the apartment to the way they want to live, and a good designer helps define everything that you do.” It is this very reason why, from the very beginning, KSK Land collaborated with YOO. 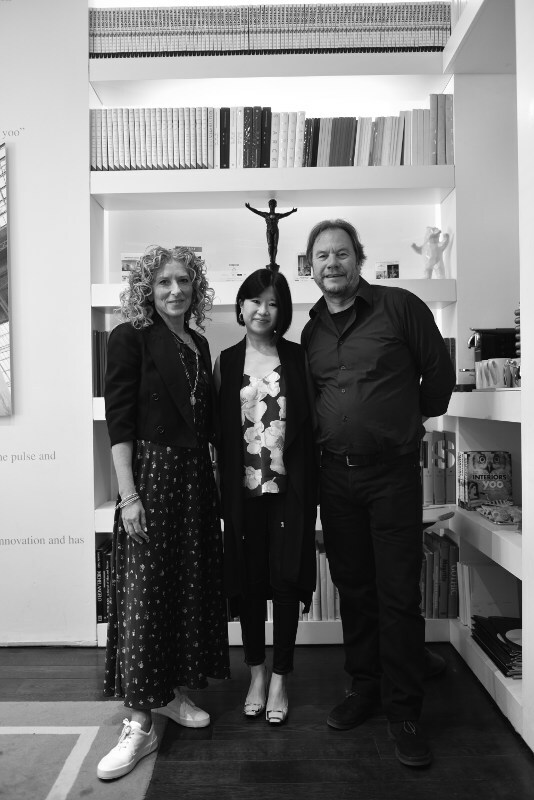 Kelly Hoppen, Joanne Kua and John Hitchcox at the YOO office in London. A pioneering vision for living and the result of a partnership between property entrepreneur John Hitchcox and celebrated designer Philippe Starck, YOO has worked with the world’s most visionary developers to design residential and hotel projects in over 30 countries throughout Asia, Australia, Europe, Africa, North and South America and the Middle East, spearheaded by creative directors that include Jade Jagger, Kelly Hoppen, Marcel Wanders and Steve Leung. 8 Conlay is YOO’s first project in Malaysia. Hoppen – whom Kua describes as “a force in interior design” – is no stranger to design aficionados. The Cape Town-born and London- based Hoppen began her design career at the age of 16. A successful author, entrepreneur and interior design maven, Hoppen’s trademark style draws inspiration from Eastern cultures, with an award-winning approach that is hinged on a neutral colour palette as well as minimalist forms that introduce calm and balance to living spaces. Harmony and calm define the Spring concept suites, which feature soothing swathes of green set against a fresh, naturally hued backdrop. These spaces make the most of neutral materials, weathered surfaces, unbleached fabrics, deep pile carpets and white milky glass, bringing to mind a sense of renewal as well as long, leisurely days spent in a luxurious country hideaway. Inside the bronze-toned interiors of the master bathroom, you’ll find Hoppen’s iconic Origami bathtub, specially created for Apaiser Bathware. Urban concept suites, on the hand, exudes timeless elegance, appealing to the inner cosmopolitan with linear muted tones and repeated motifs that bring on a feeling of understated glamour, These chicly done up spaces are enhanced with ambient lighting, while aesthetic harmony is achieved through the inclusion of taupe stone, dark timber flooring as well as specialist plaster finishes and textiles. All three, however, were convinced that 8 Conlay was more than just a simple success. “The home is the most important place in your life – it’s your place of security, a place for family, for life. Philippe and I started this business with the idea of working with great developers and like-minded people around the world to enhance home-owners lives through better design and better place-making,” Hitchcox said. Hoppen added: “I believe that what we’ve done with 8 Conlay is create something new, allowing people to get out of their norm and into a certain lifestyle. Nowadays, we want to live near the people we know and this is it. The apartments in 8 Conlay, of course, are smaller than the houses I normally work on, but size doesn’t restrict you from creating beauty and timeless luxury. “We are a young company – KSK Land is only five years old – but we’d always wanted to be developers even before that because as a developer, we actually have the power to set the stage for people to live, and to work and play in,” Kua said. Ultimately, she added: “Our tagline, ‘Your Place, Your Story’, means that 8 Conlay is a place where you create your own story. You live here and you create your own memories. The branded residences lifestyle means that everything is taken care for you so that you’ll have time to life your life. There might be three distinct parts of in 8 Conlay – the residences, hotel and retail – but all share the same vision of being a world on its own that wouldn’t work anywhere else.” A unique proposition, indeed.